After being a Mac head since the inception of the Mac in 1984, I had moved to Windows 98 then XP in 1998. I've had enough and with reviews of Vista so poor, it was time to change. So it's back to the Mac this past weekend, after 10 years of absence. Wow, things have changed! This machine (Aluminum Imac 2.4 Ghz) is incredible, plus I'm running Windows XP (just make a gradual transition) on the same machine with Parallels software. The best of both worlds! Windows certainly works, and over the past 10 years, I'd become very proficient. I feel like a total newbie on the Mac, but it's so cool, it's to be ignorant. This way they can rewrite all the textbooks in one clean sweep! 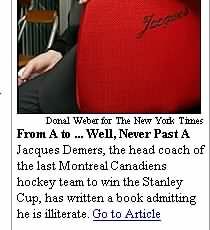 Apparently, it's possible to write a book even though you're illiterate. I've long suspected this to be true. See image from web site. Back in May, I posted a comment that suggested a change in the wet weather pattern of the past 3 years to a much drier pattern. I'm still not absolutely sure that this pattern change has occurred, the recent dry weather and storm track through the Great Lakes does suggest a change from the past 3 years. It remains to be seen, if true, how this will impact our winter weather. What does a Rescue Squad at the Jersey Shore consist of? I've decided that this trendy 'blog' format more accurately captures the flow of my daily discussions and commentaries about the upcoming weekend forecast for the Philadelphia area. I'm using blosxom , a cgi script that's available for free to create this blog format. You'll find that most of the entries on this site will continue to be my weather forecasts for the upcoming weekend. Occasionally, you may have to sift through a few of my political commentary and thoughts, but rest assured that those entries will be minimal; I have better things to do than to become yet another blogger. I really think you'll like this new format for the forecasts, and I'll soon have a feedback form on the site to allow you to comment and provide feedback. Wireless in Philadelphia!^%@! Maybe just smokeless! Since I've decided to share my personal views and experiences online, I think I should weigh in on the controversy regarding Philadelphia's plans to offer wireless services to its residents and visitors. What a crazy idea this is! Here's a city that can't even get the traffic lights to work together on Lincoln Drive and it wants to offer high tech wireless to a large geographic area. Do they have any idea what involved? Do they know that by the time they get it working (if ever), their investment in their choice of a wireless standard will be obsolete. I can only guess there's something in it for one of the relatives of the mayor or City Hall. Perhaps they'll get a lucrative contract and by the time this Mayor's second term is over, it will be a defunct plan. There's no way this city can compete with Verizon or Comcast, nor should it. Where are all those 'disadvantaged' residents of the city going to get laptops? They probably won't be able to use the service inside their homes. (Anyone with a home wireless network knows the problems with transmission through walls, etc.) And what about security and tech support? The idea of providing wireless to all city areas is ludicrous! Maybe Rittenhouse Square and some other hot spots in center city, but everywhere?...I don't think so! I think the city has a better idea to go smokeless! Cleaning a garage out isn't as easy a project as it looks: the plaster anchors that don't quite stay put, the realization that you need things at Home Depot you've forgotten to buy. But a good project for a rainy day. It's still raining out this morning and will likely stay cloudy all day. It's a rainy day here in Wyndmoor. I'm going to clean out the garage with Carol. I guess that's what we're gonna do. I can't wait. I'll tell you more about it later. Why don't they refer to SUVs as trucks? They're big, they have big wheels and they burn 10-14 mpg. Isn't anyone concerned that they are using much more oil and polluting 2-3x as much as they have to? You'd think so, but I don't see any evidence. What's it gonna take? So here are some thoughts about things: Why are the PA Lottery Results "audited by Certified Public Accountants"? Does it take special training to read the numbers on the white balls? Is that a course that accoutants take? I'm just curious.